I was born in North Shields in 1964, but moved south on the day of decimalization and have been a Home Counties person ever since. I went to school at Lancing on the south coast, where I played chess – and amongst other things learnt Russian, which turned out to be a useful thing in later life. As a teenager I went on several educational cruises on the SS Uganda, during which I learnt to play bridge for the first time. Through my university years I remained primarily a chess, and also backgammon, player and it was only after buying my first home in Borehamwood that I started playing duplicate regularly at the “Owl and PussyCat” in Wood Green with Derrick & Hazel Kime and Jean Anderson, then at Welwyn and also at Watford where I regularly partnered the late Julie Snell enjoying the ups and down of opening a “mini NT” and a system which included a forcing pass. Since that time my bridge affiliation has always remained with Hertfordshire. I have long supported the Herts Bridge Association serving on the committee as Treasurer before becoming President once in 2003-4, and for a second time last year. My career in business planning and finance with Nortel, a Canadian company in the telecoms industry, took me overseas to India and then Singapore, where I played regularly. On my return to the UK, I met Alex – a Russian from deepest Siberia. We have lived together for 17 years now and will be celebrating the tenth anniversary of our civil partnership in Portugal this April. Alex has no patience for cards or board games – so we spend our time together in the garden – I do the weeding, while he does the creative bits. I worked in Moscow as the General/Finance Director for Nortel’s Russian business for six years until 2010 (without any competitive bridge as a diversion). I finally retired in 2012 since when I have had more time to focus on bridge – both playing and directing. 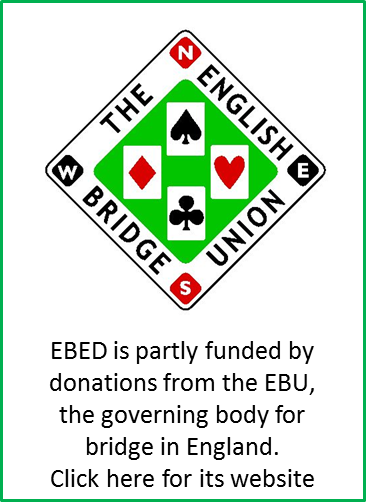 I completed the EBU’s Club and County TD training courses and now run County events for Herts, Middx, Surrey and the LCBA as well as directing club duplicates every week at Phyllis Court BC in Henley and at Richmond. You will also find me as an EBU Director at several events round the country during the year.